Exploring Vaglia and Mugello mountains. You must be a member of the Florence Hiking & Weekend Trips Group to attend this activity. Would you like to join this group? This path will make us discover territories not very far from Florence : Vaglia and Mugello that was the birthplace of Medici family and Giotto. Protected content we will reach Pieve di San Pietro,one of the oldest church in Mugello prior to the year one thousand. We will follow the path that rises steeply towards woods and cultivated fields up to the wonderful ridge Poggio Scarabone with fascinating panoramic views :Monte Morello,Monte Sinario, la Calvana and Monte Falterona . We will walk on a beautiful panoramic path overlooking mountains, and descending along the ridge we will stop to church of Sant’Andrea a Cerreto Maggio, rising on the ruins of an ancient castle belonging to the Cerretani family. From here we will come back to Vaglia. Duration: daytrip (packed lunch by the participants). Equipment Required:Trekking sticks, Hiking boots, water supply (1.5 liters minimum) packed lunch by participants. 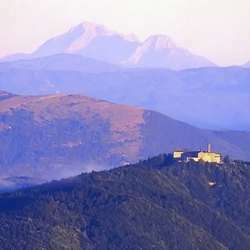 Note: an option to hold in Vaglia for a dinner to taste the famous “Tortelli Mugellani” may be decided after hiking day. More details will be given to the enrolled people . We will be together with an l English speaking guide, who will explain more about the flora, the fauna, the geology and the history that characterize this territory. Save the date and Join us! You will spend an unforgettable day walking between magnificent views over the Mountains! I look forward to receiving your confirmations! Pls contact me privately to share your Whatsapp number .